Happy Goats. Delicious Cheese. Wonderful Life. Hoofprint Cheese Company is a small-scale artisanal goat dairy and creamery located in the heart of the mid-Hudson Valley. Hoofprint Cheese Company is a small-scale artisanal goat dairy and creamery located in the heart of the mid-Hudson Valley. We focus on providing humanely raised and sustainable food to our local community, which stretches from New York City to Albany. All of our products are sourced and processed by us on our farm in Millbrook, New York. If you haven't met us yet, we are Brendan and Katelyn Foley. Just a short while ago in 2015, we found ourselves drawn back to our hometown from Brooklyn to begin what we hope would be the rest of our lives, on our dairy goat farm. While it could be quite a shock to some, it really wasn't as far-fetched as it seems, it was actually a natural transition back to what we loved. Katelyn had actually grown up on the farm, raising a whole menagerie of animals with her family, including goats. In fact, for many years, Kate's family had owned and operated a small goat creamery as well. The goats had been Kate's primary love, and she only stopped raising them when her career brought her to the city. As a teenager and young adult, Brendan had spent his summers and free time working on the farm, even milking the goats on the weekends. However, after about five years in the city, we both found ourselves yearning for our weekend getaways back to the farm. Though we both held excellent jobs, the concrete jungle was no match for our rural Hudson Valley roots. So in 2015, we moved back to Millbrook, with the dream to start our goat dairy, selling raw goat's milk and artisanal goat cheeses. We started revamping the milk parlor and creamery and purchased our first goat, Velvet. Since you can not have just one goat, many more goats were added to our herd quickly thereafter. There were many questions at first, but a couple of things were certain. First, it was the lifestyle we were after, as the hustle and bustle of the city was what we were looking to leave behind. Second, our animals would be our family. 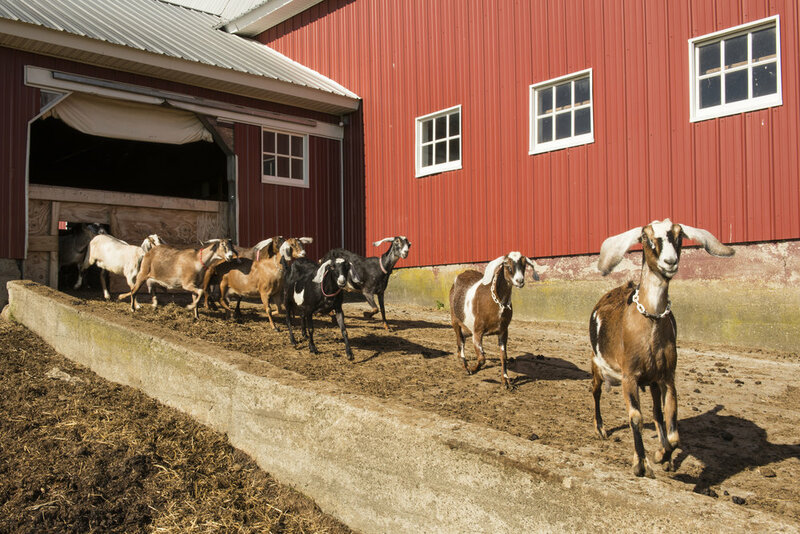 Our primary focus was and continues to be, to provide a happy and luxurious home and life for our goats, the real stars of Hoofprint Cheese Company. These ideas became the cornerstones of our motto "Happy Goats, Delicious Cheese, Wonderful Life". In July 2016, we officially opened our doors for business, becoming a New York State licensed raw milk dairy and creamery. Nowadays, you will often find Brendan in the creamery, making cheese or experimenting with new recipes, lending his love of science to the cheese making process. And Kate is always busy in the barn, milking the goats and giving them the best care possible.